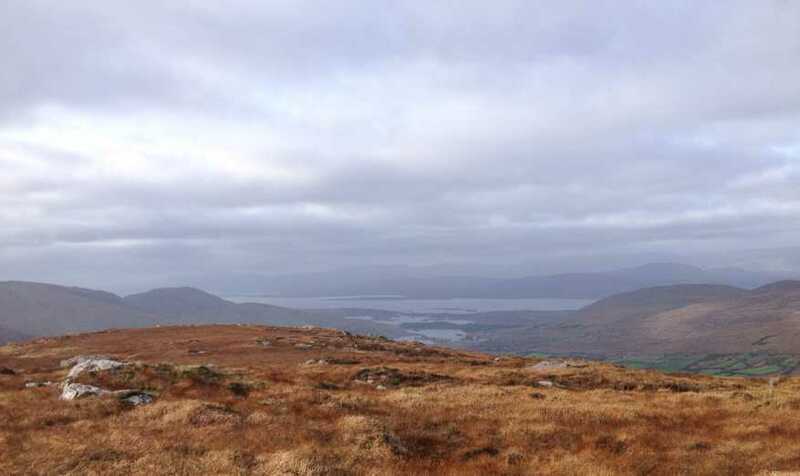 Alternatively this name may derive from Cnoc na Garbhghaile [T6000], 'hill of the rough wind'. Knocknagorraveela is the 547th highest place in Ireland. From a summit baggers perspective, it's most likely you'll be approaching from the Beara Way via Derrysallagh and/or Knocknagorraveela NE. The approach from Knocknagorraveela NE is straightforward, but care needs to be taken if you are taking the direct route from Derrysallagh as the area around the river in the valley between the tops has some nasty hidden holes. Another place to start is at the forest entrance at V846626 A in the Clonee Valley. This glacial valley is well worth a visit in its own right having dramatic sides and big lakes. Leave the road and head into the valley to the W of Knocknagorraveela. If you go through 854629 B your track should be on uncultivated ground west of any fields. The river can be crossed somewhere to the NW of the summit for example at 866632 C.